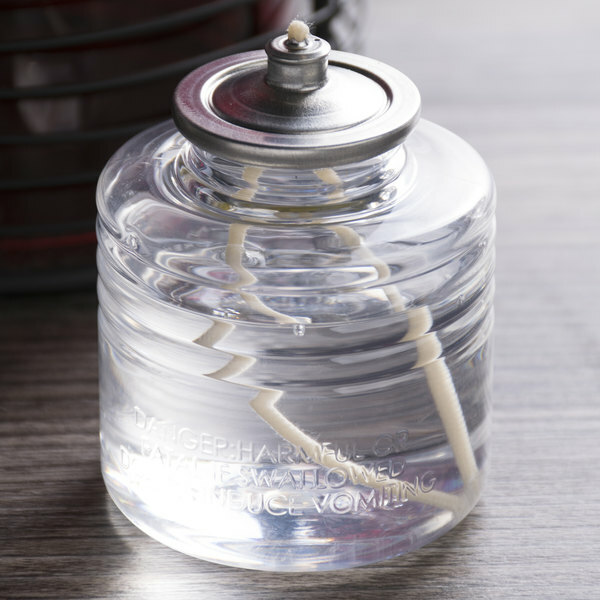 Illuminate your tabletops with the help of this Sterno Products 30512 30 hour "smokeless" liquid candle fuel cartridge! This fuel cartridge will help you create a warm and inviting atmosphere that is sure to instantly transform your restaurant, catered event, or outdoor dining space. 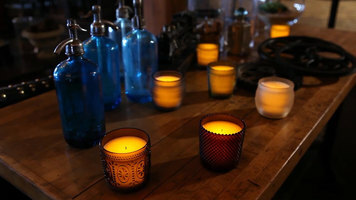 It's made of safe, liquid paraffin wax that produces a real, flickering flame for a tranquil atmosphere. Plus, it doesn't melt wax, allowing you to avoid the messy drippings often associated with standard wax candles. 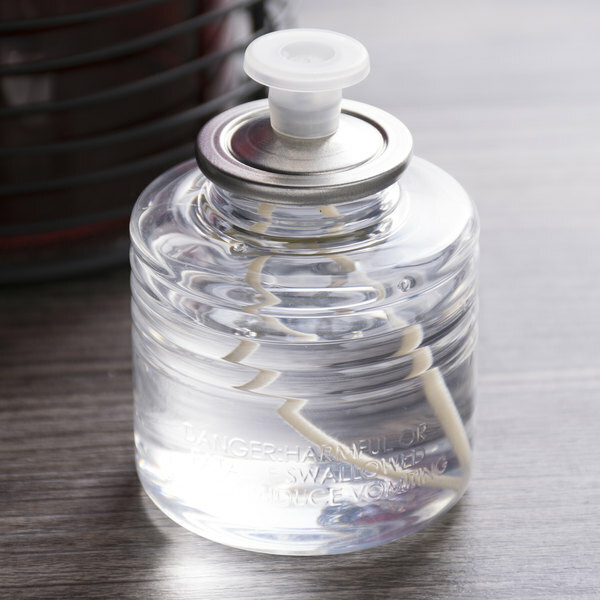 It also eliminates the unappealing presentation of distorted, melted wax, ensuring an attractive presentation every time you use it. "I have been looking all over for s small oil lamp to put into a small container with glass beads for a party and these lamps fill the bill. For extra light pull up on the wick. WONDERFUL!! The price is much better than Any other supplier." 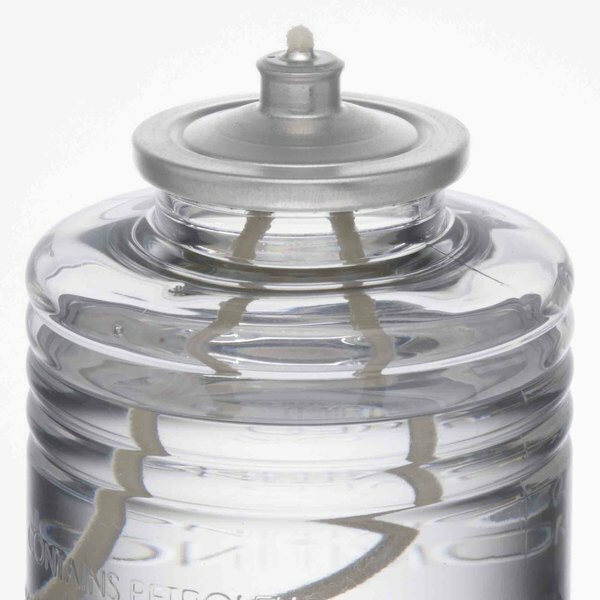 This cartridge will burn for 30 hours, allowing you to use it for multiple events to reduce replacement costs. 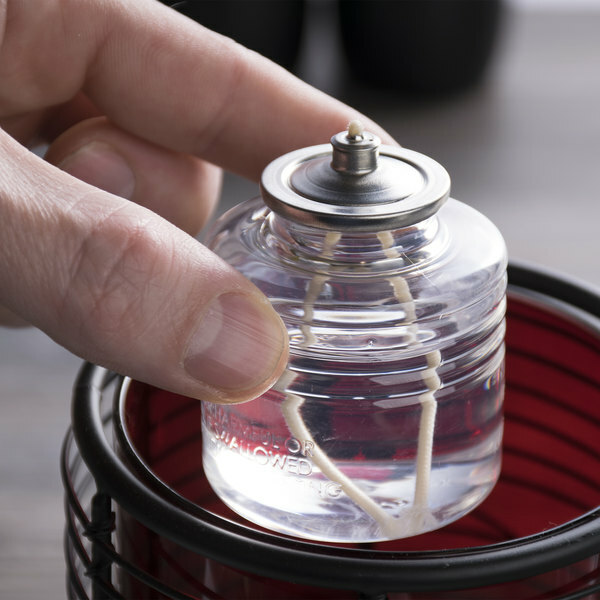 The aluminum top plate provides a leak-free seal and holds the wick in place to deliver the liquid to the flame. Thanks to its smokeless design, it won't create any unpleasant fumes or disturb your guest during their meals. Simply place the cartridge in a compatible, decorative lamp and add it to dining or accent tables. Thanks to its PET plastic exterior, it can easily be disposed of once the cartridge is empty. 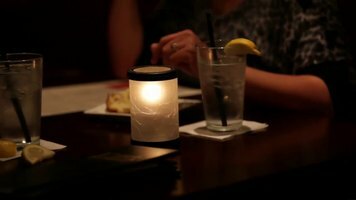 Add ambience to your establishment with the help of this liquid candle! Did the bottle design for this candle fuel change over time? 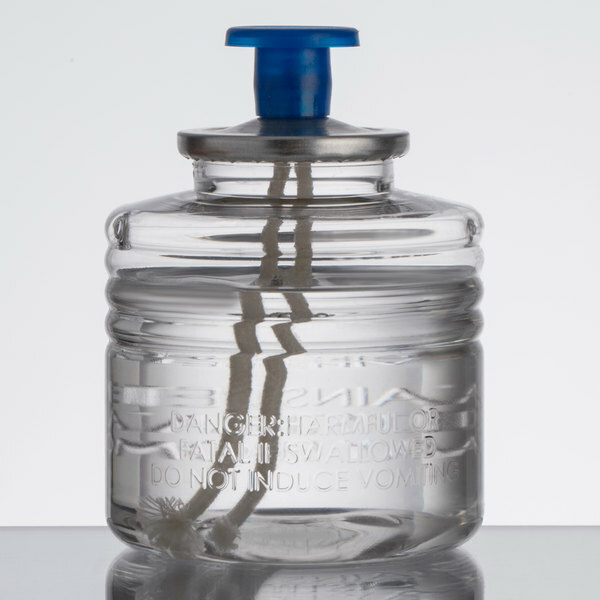 Yes, Sterno improved the bottle structure for safer handling per the Global Harmonized System (GHS) restrictive flow testing requirement. 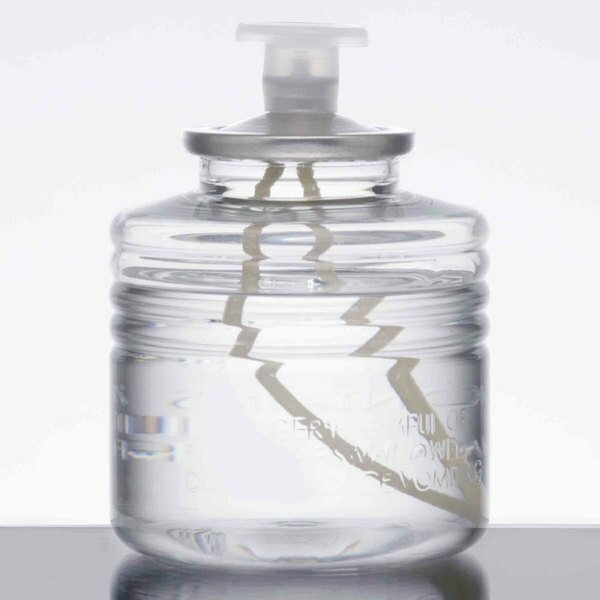 The new design also no longer requires the GHS warning label for a more appealing aesthetic. 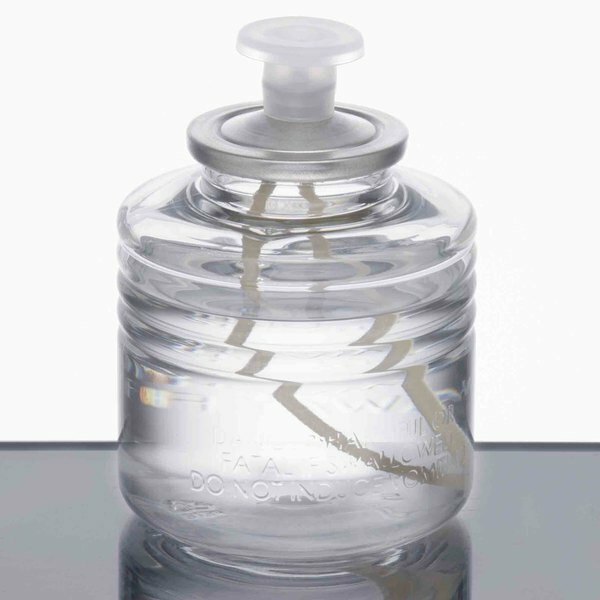 Note that these improvements slightly changed the size and shape of the bottle, which may result in it no longer fitting in a container that you previously used. This product can expose you to chemicals including carbon monoxide, which are known to the State of California to cause cancer, birth defects, or other reproductive harm. For more information, go to www.p65warnings.ca.gov. WARNING: This product can expose you to chemicals including carbon monoxide, which are known to the State of California to cause cancer, birth defects, or other reproductive harm. For more information, go to www.p65warnings.ca.gov. Just an amazing Liquid sterno candle.great value for your money.i have bought many of these and they never fail to amaze.will keep buying these for a long time. Good price with quick shipping, great packaging. Shipping can get expensive so make sure to load up, no leaks, burns fine will order more when needed. The are the perfect size I needed, I am so happy that the description lives up to the acutal product!! No smoke and odorless, ITS WHAT I NEEDED!! I have been looking all over for s small oil lamp to put into a small container with glass beads for a party and these lamps fill the bill. For extra light pull up on the wick. WONDERFUL!! The price is much better than Any other supplier. These are much cheaper at webstuarant store than they are from our food supplier. Another good buy from this website. Would definitely reccommend. Thank you! 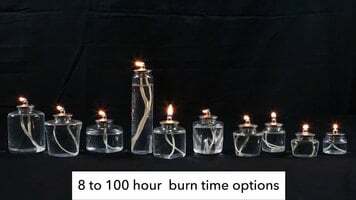 Check out this comparable Leola Candle alternative instead! Create a warm, inviting atmosphere in your business with the glow of a Leola Candle fuel cartridge, tealight, votive, or tapered candle! From tabletops in a fine dining setting to hanging lanterns at an outdoor wedding, the candles from Leola Candle are crafted to enhance their surrounding environment.